Best Practices for a Safe, Festive Halloween Night - Law Offices of David M. Benenfeld P.A. This year, Halloween falls on a Wednesday, which means you and the kids will be rushing around to get in all of that Halloween fun before school the next day. You can maximize your family’s enjoyment without sacrificing safety just by being prepared for this trick-or-treat season. Most importantly, you and your loved ones need to be on the lookout for safety and health hazards. Halloween tends to be more than just a threat of spooks and screams from haunted houses. In fact, it is a peak time for emergency room visits too. Hospitals are overwhelmed dealing with everything from accidents to injuries to illnesses. Prepare for the upcoming fun and save yourself the cost and stress of an ER visit by following these safety tips. Halloween sees a heightened number of motor vehicle accidents. These accidents are not just car versus car, however. Instead, they include more instances of vehicle versus pedestrian. This is even a greater danger with more children out in the dark on Halloween night than usual. Children out on the streets trick-or-treating combined with adults leaving Halloween parties can spell disaster. If your children will be out in the dark, make sure they remain seen in their costume. While it might diminish the “fear” factor, have their black costumes brightened up with glow-in-the-dark sticks and necklaces or reflective tape so that vehicles see them easier. Also, give your children flashlights, teach them to stop at intersections, and make sure they know to walk on the sidewalk. When crossing the street, they should still use the crosswalk. Jumping out between cars into the middle of the road increases the chances a vehicle will not see them. Lastly, make sure your child’s mask or hat does not block their field of vision. When they cannot see where they are going, they are more likely to miss oncoming vehicles when they check both ways before crossing. It is not just children at risk for accidents on Halloween. Adults who attend parties might be compelled to drink and drive. There are increased numbers of DUI arrests on Halloween. And while you cannot prevent people from leaving houses in the area intoxicated, you can prevent them from leaving yours. If you have a Halloween party, do not let anyone leave your home that is intoxicated. Not only are they at high-risk for causing a serious accident, but you could be held liable for supplying the alcohol and allowing them to drive drunk afterward. Eye injuries happen on Halloween, especially with the sticks, canes, swords and other sharp objects kids use to finish their costume. Even if they are plastic props, they could cause permanent eye damage due to their sharp edges. Teach your child not to play with those props or poke anyone with them. Also, they should not run with a prop that has sharp edges nor take it to school where they run the risk of injuring a friend during playtime. Halloween means trick-or-treating in not-so-well-lit areas of the neighborhood. As a homeowner, you are responsible for keeping your property safe. Remove any tripping hazards from your driveway and the walkway leading to your front door. That includes any cords or debris. If you have Halloween decorations up, make sure they do not block the walkway or create an obstacle for small children. If your sidewalks are uneven and cause trips, consider moving your Halloween candy to the driveway so that trick-or-treaters do not have to risk walking over those hazards to get to your door. 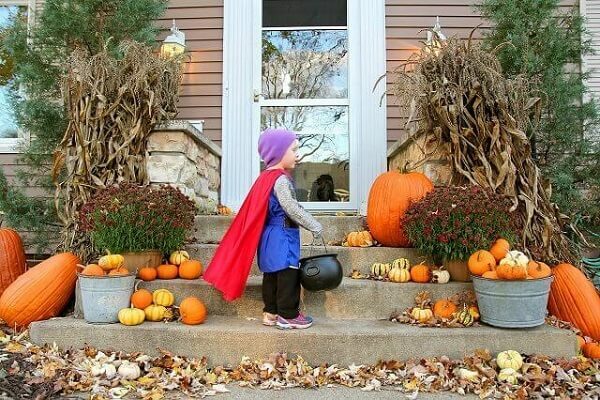 For your children out trick-or-treating, give them shoes with proper soles and make sure their costume is not too long that they trip over it. Burns are also common on Halloween. Make sure your child’s costume is flame-retardant. Do not let your child wear a costume that has long sleeves, capes, or wigs that could catch fire as they walk by a live flame. When making your Jack-o-Lanterns or decorating your porch, avoid the use of live flame candles and opt for LED look-alikes instead. Before your children eat their candy haul for the night, inspect each piece of candy to ensure it is safe for their consumption. Look for signs of tampering, and only allow your child to eat candy appropriate for their age. Small children should avoid small hard candies that they might swallow and become lodged in their throat. Likewise, smaller children should not be allowed to chew on taffy and other sticky candies that may be hard for them to consume. While rare, poisoning injuries can occur from tainted candies. Inspecting your child’s candy bag first and removing any items that appear questionable can help prevent it. If your child is injured on Halloween night due to someone’s negligence or purposeful acts, you may be entitled to compensation for those injuries. Halloween should not be a night your child fears the rest of their life. For serious injuries that require hospitalization or long-term care, you need compensation for your medical costs, lost wages, and the physical and emotional trauma your child suffered. Speak with an injury attorney now from the Law Offices of Law Offices of David M. Benenfeld P.A Our team will aggressively fight for your right to compensation. Speak with us now for a free case evaluation at 954-677-0155 or request more information online.